This work will be included in the 'Catalogue des Projets de Tissus de Raoul Dufy' currently being prepared by Fanny Guillon-Laffaille. This work was created for the famous silk house Bianchini-Ferier for whom Dufy worked between 1912 and 1930, producing textile designs as well as designs, such as this one, promoting their wares. Having established international fame by the first decade of the twentieth century, the house became renowned for their designed fabrics, supplying many of the famous fashion houses in the 1920s. The experience proved of considerable importance in the development of Dufy's fine art, and the two were for him closely inter-related. Indeed, Dufy once said, “Mes dessins sont aussi des desseins, aucun d’eux n’est fait pour lui-même’. 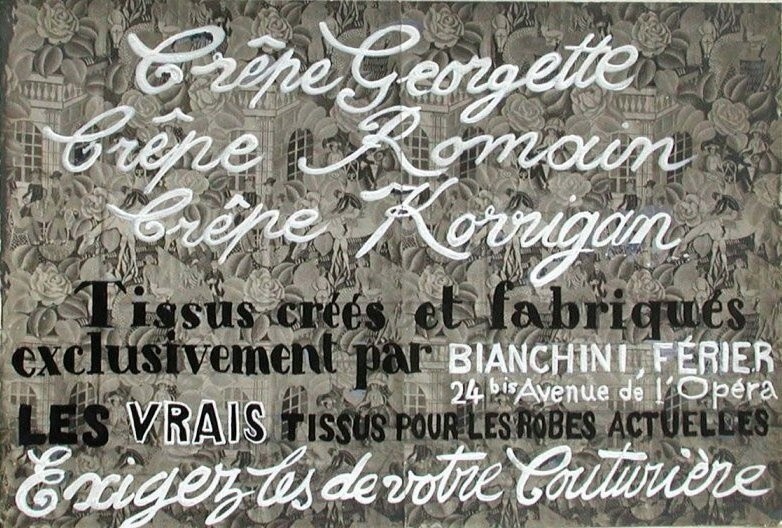 The photographic paper used as the 'ground' for this design relates very closely to 'Le Polo de Bagatelle' (also exhibited) a design for furnishing material.